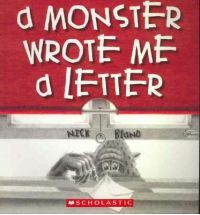 A boy gets a letter from a monster and he’s not sure what to do. He wonders if the monster is scary, or if he comes what happens if he won’t go away. The boy decides to meet the monster and does what he think he has to do to make the monster feel at home. The simple rhyming text is coupled with black and white illustrations that are whimsically highlighted with touches of colour. This is a wonderful and funny story about what happens when a boy and a monster meet.